Robberies, vandalism/break-ins, employee thefts and shoplifting cost commercial business owners over $35 billion last year, with that number expected to rise in 2016 due to a combination of economic stagnation, the ongoing epidemic of heroin and methamphetamine use in the U.S. and sustained gang activity in urban areas. Unless business owners invest in effective and dependable security devices to protect their livelihood from criminal activity, they will remain at a high risk of becoming victims of traumatic intrusions. Considered a first point of security for businesses of all sizes, door closers force doors to close as quickly as possibly via regular arm, top jamb and parallel arm hardware attached directly to the door. In addition to reducing energy costs in climate-controlled businesses and keeping out insect pests, door closers are available in different sizes to accommodate different security needs. 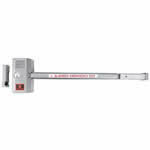 For example, size #1 door closers exert two pounds of closing force, size #3 door closers exert five pounds of closing force and the strongest, size #6, exerts 14 pounds of force. Door annunciator systems centralize the location at which multiple doors can be closely monitored, in addition to providing information about whether a door is open, closed, locked, unlocked or malfunctioning. Producing a chiming or buzzing sound when activated, specialized door annunciators can be integrated with intercom or video systems to further enhance security. Moreover, information provided by an annunciator may be transmitted to access control devices or PCs where data can be recorded and included in a company’s audit logs. Door annunciators are useful in large warehouses, dressing rooms and isolated areas where criminal entry is more likely to occur. Deadbolts are called “dead” locks because no springs are needed to operate the bolt. By “bolting” a door to its frame, deadbolts prevent criminals from prying open a door, especially when deadbolt locks complement sturdy security doors. Length of deadbolt “bolts” that slide from the lock housing into the door frame are an industry standard one inch but can be made longer to accommodate door material and security needs. Single-cylinder deadbolt locks are operated using a key from the outside of the door. Double-cylinder keys operate the lock from inside and outside the door. 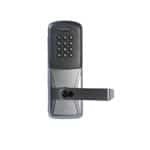 Keyless entry deadbolts rely on users entering a code into a numeric keypad to operate. For solid doors without glass panes, double cylinder deadbolts offer more security since they can be locked from the inside and outside of a door. Exit locks issue an alarm signal when unauthorized use of exit or emergency doors is detected. Securing emergency exit doors prevents both outside and employee theft while remaining compliant to state and federal building safety codes. Exit alarms can also be disengaged temporarily so that authorized people can enter your building through designated emergency exits. Offering maximum security benefits for businesses using outdoor sheds and security fences, high security padlocks are resistant to drilling, cutting and picking. Closed shackle padlocks protect the shackle (the bar that passes through a hasp) to make shearing difficult. Discus padlocks are circular in shape and have shackles that turn inside the lock’s body to offer excellent protection against criminal damage. Weatherproof padlocks, or “marine-quality” padlocks, are resistant to corrosion and kept preserved from the elements by a thermoplastic shell. 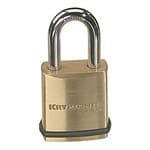 Combination padlocks are also available that do not require keys to open them. Keyless locks require input of an alphanumeric code before releasing a locked door. 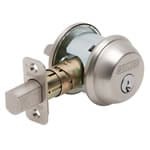 These locks can replace standard deadbolts with motorized deadbolts to provide exceptional, anti-theft protection by implementing a “rolling code” feature ensuring the same codes are not used twice. In addition, some models issue an alarm if the incorrect code is entered more than three times. Mortise locks differ from cylindrical locks because the pocket (mortise) is cut into the door where the lock is fitted. Since mortise locks are placed inside the door, intruders have a hard time forcing the door open. Additionally, the lock is comprised of numerous levers and notches, making it difficult for even skilled lock pickers to pick. 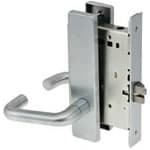 Its dual locking mechanism also allows for locking of a door from the inside and outside. Locksmiths suggest opting for mortise locks with at least five or six levers for optimized security. 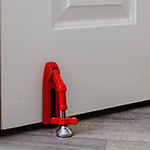 Door jammers are affordable security devices useful for securing doors without locks or have locks that are malfunctioning. Placed at the bottom of a door, lightweight door jammers exert strong forces on doors to prevent the door from being opened. Portable and easily removable, door jammers should only be used in emergencies and should never be relied on as a form of permanent security. Don’t give criminals the chance to financially devastate your business. Contact Great Valley Lockshop today to have anti-theft, commercial door hardware installed immediately and enjoy peace of mind tonight knowing your business is safe and secure from theft and break-ins.